The comfortable cushions and open design make this one popular. This is a nice looking design! 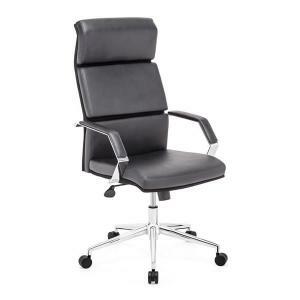 The Dean Modern Conference Chair has a leatherette wrapped seat and back cushions with chrome solid steel arms and frame. There is a height and tilt adjustment with a 5 point chromed steel rolling base. W22.8" x D22" x H37", Seat W19.7", SD18", SH17.7", Arm H26"